Do I like this mantra? No, not at all. Is it true? Yes. Absolutely. Rickshaw and taxi drivers will claim your hotel is full, roach-infested or burned down just to get you to go to a place of their choosing. If you insist on your original destination, they often refuse to take you or double their prices. On the occasions that we aren’t swarmed by drivers wanting to take us somewhere other than where we intend, we are quoted absurd prices for travel. We once had a team of men attempting to get us to take a rickshaw to our hotel for 150 rupees. After a few minutes of searching around, we found a driver willing to take us and use the meter for the rate. The cost was 21. 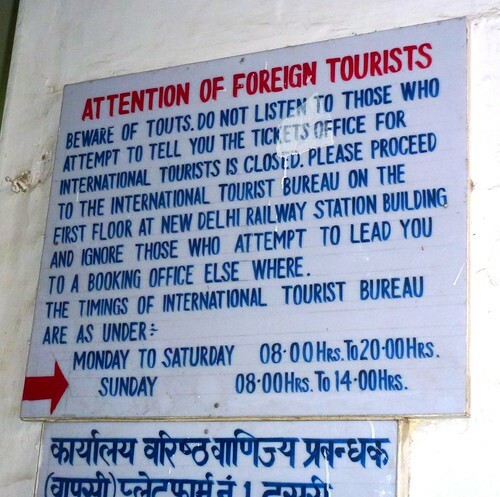 At the New Delhi train station, one of India’s major transport hubs that has a fantastic foreign tourist ticketing office, the scams are so thick that the tourist office has signs all over the place warning you to not pay attention to those who attempt to lead you astray. Scammers will attempt to steer you away from the tourist office and into a travel agency where you will be bamboozled into buying train tickets for far more than the actual ticket cost. If you are particularly uninformed they may convince you that there is no train to your destination and you might wind up handing over absurd amounts of money for flights, luxury bus services, or totally unnecessary private car transport. Another common scheme is to try to stop tourists at the security checkpoints and tell them that their train tickets need to be ‘validated’ for a hefty fee or you won’t be allowed to board. There are dozens more tales of travelers being manipulated as they attempt to board trains – your train has been cancelled, your train is not longer going to this stop, your train is delayed 22 hours…come with me, I can help you make other arrangements! Recently we had two separate sets of people attempt to tell us we were headed towards the ‘wrong’ exit for the train station upon arriving in Jodhpur, despite the enormous “EXIT” signs we were following, and the fact that literally everyone was headed the same direction. Justin laughed heartily in the faces of these touts and we kept going our own way. In another instance, we had gotten off a bus at a fairly large terminal, and I needed to use the bathroom. As I walked up to the clearly marked women’s restroom, a man ran in front of me carrying a table. He put it down right in front of me and demanded I pay him to go in. I refused and walked away. We’ve had to pay numerous times to use restrooms, but this time just seemed like extortion. I really did need to go, so I went to the station manager’s office, asked where the bathroom was, and asked if there was a charge. 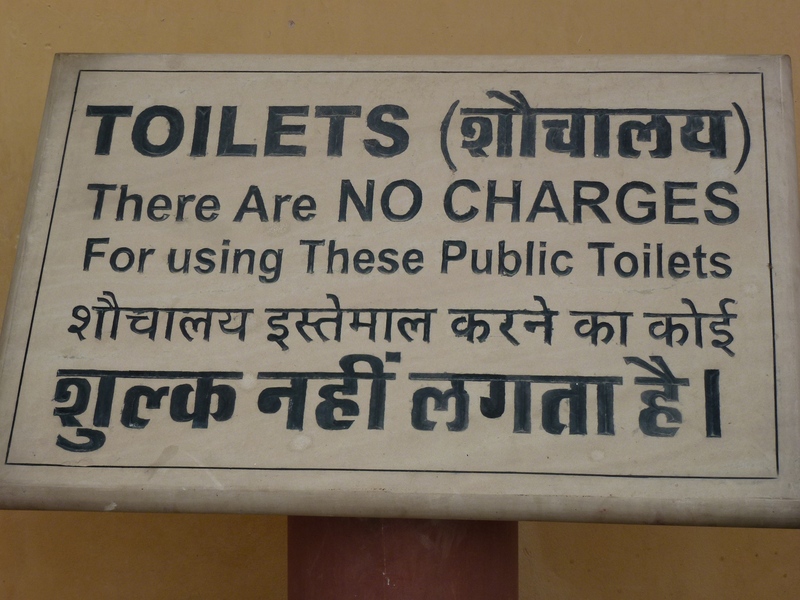 I was directed back to the bathroom I originally tried to use, and told that no, there was not a charge. When I went back, the guy was nowhere to be seen so I went in. As I was closing the stall door the man ran in after me and tried to come into the stall, demanding I pay him. I yelled “NO! GET OUT!” and pushed back on the door harder than he expected, causing it to slam in his face. Justin came storming in as this was happening and dragged the guy out of there to the station managers office where he confirmed, no, we didn’t have to pay. This kind of thing is both exhausting, and infuriating. One way to avoid the hassle of haggling with rickshaw or taxi drivers is to go to the pre-paid stands that are just outside most airports and trains stations. Even then, you need to stay on your toes as we learned just minutes after arriving in Mumbai. We had gone to the pre-paid taxi stand at the airport, where we were told it would be 480 Rupees to get where we needed. It wasn’t until we were out of the terminal and into the taxi that we looked more closely at the receipt and realized it should have been 430. The woman at the counter had written the ‘3’ so it looked sort of like an 8, and when we added up the charges, sure enough, it was 430. Lesson learned – pre-paid services can be handy, but check the receipt CAREFULLY before you hand over your cash. At this point, we try to always have a plan for where we are going before we even begin the journey to our next stop. We contact local hotels and ask what we should be paying in a taxi or rickshaw to get to them. When we’re in doubt or need help the ONLY place we go is to the police or the tourist office. If someone tries to check our tickets, or charge an entrance fee for something, we only allow them to do so if they are in uniform, in an official booth, or if the guidebook says there is a fee. If those things aren’t in place, we ask a security guard, police officer, or station manager if we should be paying extra. It can be extremely aggravating, but by following these steps we think we’ve managed to avoid the worst of the scams, at least so far.